This post is sponsored by SmartSquat. For our sponsored post policy, click here. You’ve heard us talk a lot about the pros of working out at home — and that’s because it’s such a fantastic option! When your house is also your gym, you can fit in workouts whenever you’ve got a bit of free time. You can do anything you want (cardio, strength work, dancing like nobody’s watching — because nobody is! ), wear whatever you want, and do it all for however long you feel like it. But there’s one big problem with working out at home, alone, and that’s the fact that the likelihood of doing certain moves incorrectly is substantially higher if you don’t have someone there who’s knowledgeable enough to correct your form. Because bad form brings with it three main issues: For one thing, doing even basic exercises, like a squat, without good form increases your risk of injury. You’re also not getting nearly as good a workout if you’re not engaging all the proper muscles. Plus, even if you’re pretty good about checking your form and correcting it when you’re a bit off, how much time do you suppose you waste checking and correcting yourself? And do you really think you’re able to correct yourself efficiently when you’re super fatigued? I know I sure can’t — sometimes it’s all I can do to remain upright! 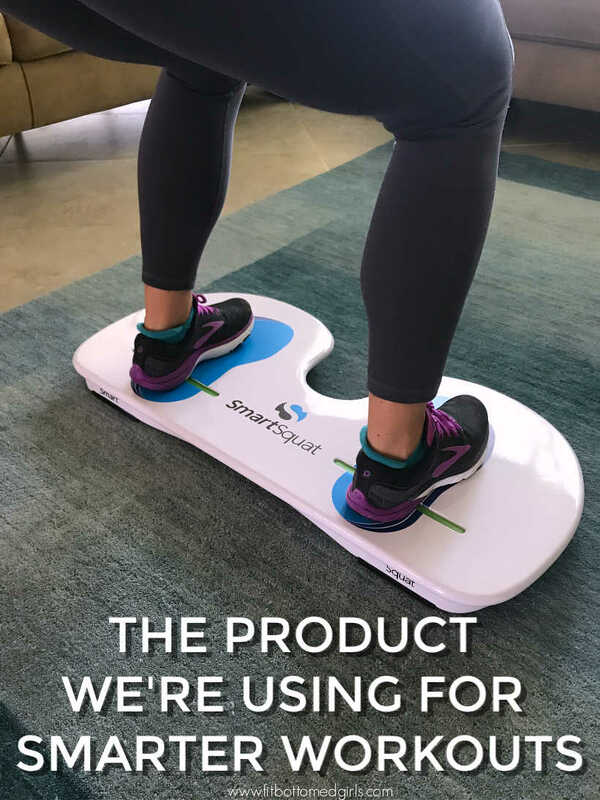 Don’t let the name fool ya — the SmartSquat helps you do lots more than just squat properly (although, if you’ve got a squat you want to improve — single leg, curtsy, etc. — it’ll be your new BFF). 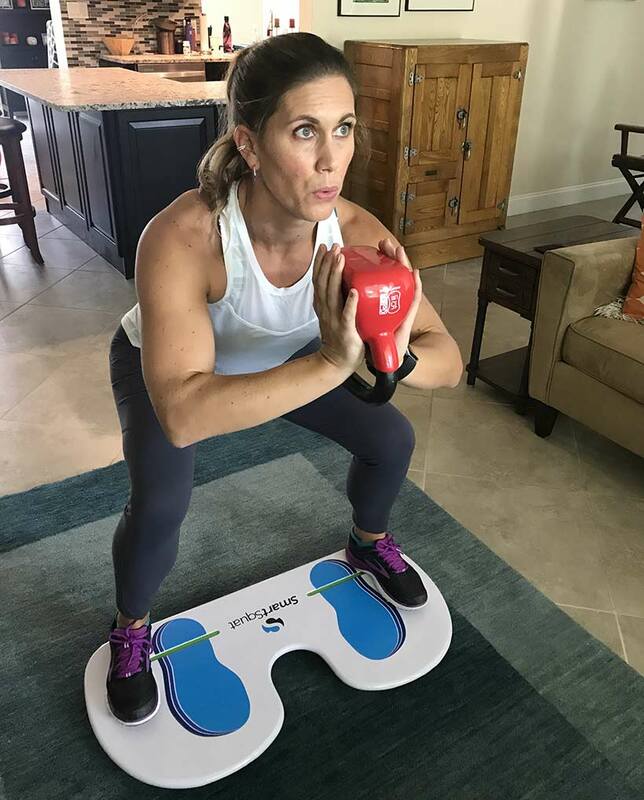 Moves like lunges (in any variation you can imagine), Romanian dead lifts, and hip bridges are all more effective and safer when your weight is centered through your heels and arches, and the SmartSquat gives you a clear, physical cue when you’ve got your weight properly loaded. The Tipping Beam is the key. When you’re on the SmartSquat with your ankle bone properly lined up with the Center of Gravity Line (regardless of whether your feet are on the footprints, between them, or outside of them), the board will rest up onto the Tipping Beam and stay there for as long as your weight is properly distributed, but should you shift too much your weight onto your toes or lean too far forward while bending (things that tend to happen as your muscles become fatigued )… you’ll know immediately, because the SmartSquat gently tips back down to its starting position, enabling you to make a correction instantly. 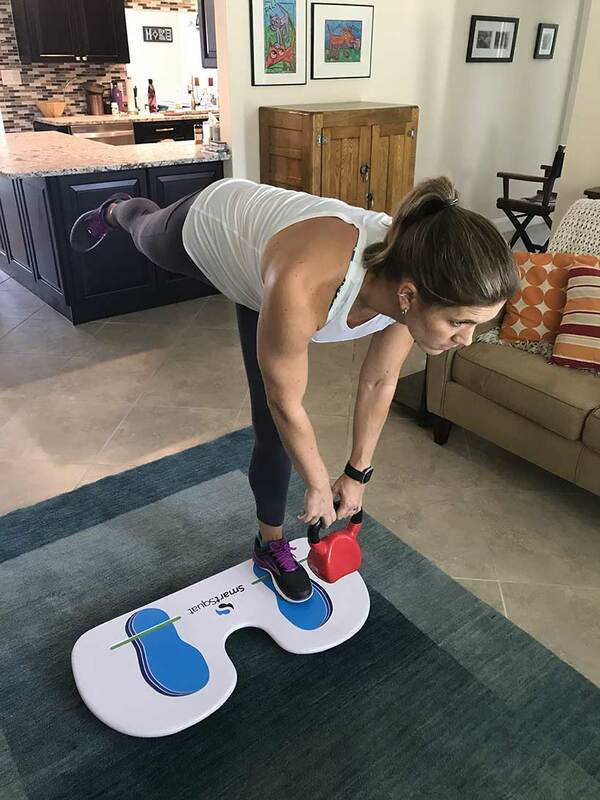 Aside from relying on it to correct the form of lower body exercises, you can also use it for all kinds of free weight exercises because that simple, gentle cue will help you maintain good posture during things like biceps curls, shoulder presses, and more — because, let me tell you, it’s really hard to keep your weight shifted back if you’re rolling your shoulders forward or bending at the waist! 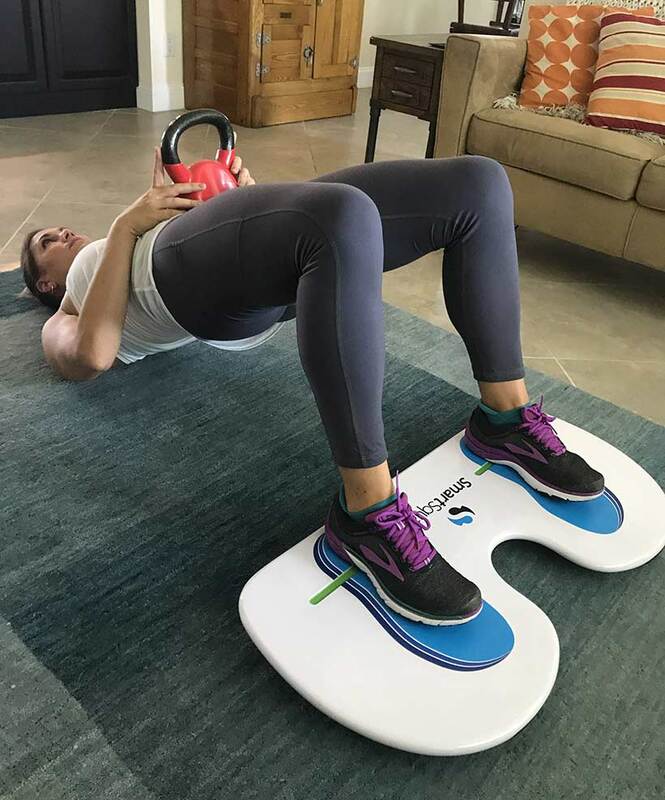 Some people have also credited it with helping them improve their plank form by forcing them to keep their abs engaged and weight shifted forward when their toes are on the SmartSquat. Now, I’ve got a good bit of gym-going experience — and I’m still finding these cues beneficial, particularly late in a workout when I can’t quite trust my quads to keep doing what I’m telling them to do. And while it’s helpful with my squats, where I’m really noticing the difference is in my lunges. I struggle to get low in a lunge with good form because of some knee issues, but without feedback, it’s really hard for me to tell at what point I begin to compensate for that challenge by pitching forward. When I have my lead foot on the SmartSquat, whether I’m doing repeating lunges or holding a low lunge for a set time, it’s really obvious when I’ve tried to go too low or am no longer able to hold that pose properly. Loving this concept as much as I am? Make sure to enter to win your own below (or here)! And, since not everyone can be a winner, we’re psyched to also offer 25 percent off to everyone — just enter the code FBG25% at checkout! Plus, SmartSquat will be sending out a bonus offer to everyone who enters the contest, so seriously, guys, even if you aren’t one of the actual winners … you’re still getting hooked up. This sounds like a great product. Something I can definitely use. I need this to get a better booty, that everyone will think is cutie!!! My biggest challenge to working out at home, is equipment. I don’t have a lot of weights or equipment that I can use that I think would provide me a great workout at home. 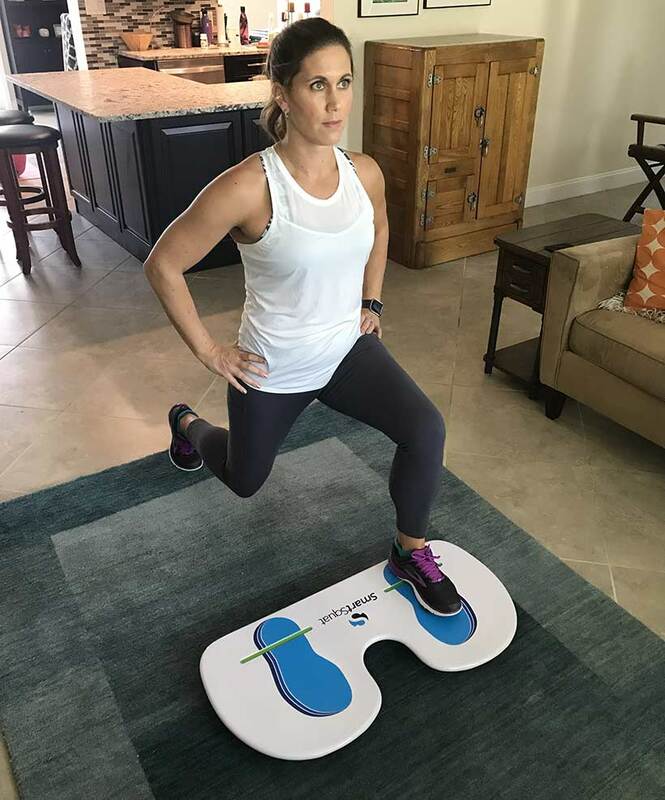 i thinking having the smart squat is a perfect addition to allow me to workout at home more effectively. Sounds amazing…I could use a little help with my form! This sounds like a great product. It is very interesting something I can definitely use and i love the blog, and live a healthy life. Get rid of muscle and body pain check Stem Cell Therapy for free consultations. The main challenge I face when I workout at home is the everyday little distractions. thanks for sharing looks promising. Great job man! Always pleasure to go through articles! Despite the popular belief that you are not really squatting, unless you just about touch ground, going too deep in your squat is actually not the best idea for various reasons. There are quite a few aspects to consider when attempting to perfect the ideal squat and avoiding certain injuries as well as minor aches and pains is possible by adopting specific techniques. Tight hip flexors, or tight hamstrings, can limit the depth of your squat and cause some noticeably sudden and unpleasant pains in your hips, pelvis, and upper legs. You can avoid this by not going too deep into your squat and ensuring that your thigh is parallel to the ground, any lower is too deep. Ideally, overexerting your body is never a fantastic idea and it is always best to gradually build up your abilities while adapting proper squatting techniques.